Congenital heart defects are cardiac defects that occur during fetal development and are then determined after birth. There are various classifications of congenital heart defects, but the most commonly used correlate with clinical manifestations, defect localization, etc. Congenital heart defects (CHD) are defects of the cardiac structures that were formed during the period of intrauterine development of the fetus. 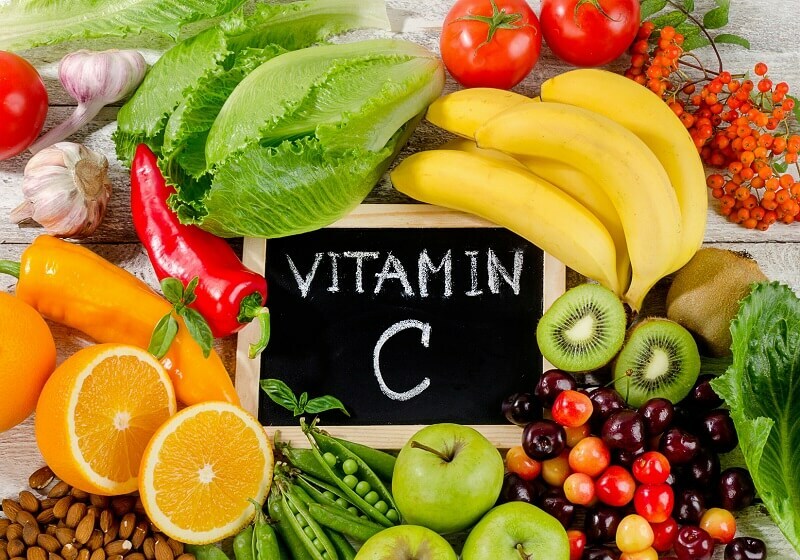 There are many types of these anomalies, so various classifications have been created to help group CHC according to individual characteristics. The most well-known classification is the international classification of diseases of the 10th revision (ICD-10). It contains 51 codes related to congenital heart defects and adjacent vessels. CHD can affect blood flow to the lungs and body. Combinations of defects can create complex pathological conditions, often life-threatening to the patient. All of them require thorough diagnosis and treatment, most often through surgical intervention. A septum (in Latin septum) is an intermediate wall of the heart that divides it into right and left sides. In the normal state between these halves after birth there is no message. Sometimes babies are born with an abnormal hole in the septum. It can be located between the upper heart chambers (atria) or the lower heart chambers (ventricles). If there is a hole between the atria, then talk about the defect of the interatrial septum, or ASD. If the abnormality is located between the ventricles, then a ventricular septal defect, or VSD, is diagnosed. defect of interventricular septum (VSD). Most atrial septal abnormalities do not require any surgical correction. In the presence of indications for surgical treatment, doctors usually prefer to carry it out at an older age, and not during the neonatal period. Treatment may consist in continuing to monitor the spontaneous closure of the defect and / or in taking the appropriate medication. For example, digoxin and lasix are most commonly used. Digoxin helps the heart to beat faster, and lasix helps to remove excess fluid from the body. Atrial septal defect is approximately 5-10% of all congenital heart defects. Since this disease is difficult to distinguish from other CHD, the diagnosis is often inaccurate. When DMPP there is a hole in the septum between the right and left atrium. In the normal state, on the right side there is venous blood, deprived of oxygen, and on the left side - arterial blood, rich in oxygen. DMPP vary in size. In all forms of DMP, oxygen-containing blood on the left side of the heart is mixed with blood on the right side, which is sent to the lungs in order to enrich itself with oxygen. This leads to a very inefficient work of the heart: too much blood is sent to the right atrium, and from there to the lungs. As a result, the pathology can cause some serious side effects, especially if not treated. Surgical treatment consists of creating special patches (for large defects) or installing an occluder (plug). Postoperative hospital stay depends on the type of DMPP (today there are 3 main types of DMPP), which can vary from 4 days to 2 weeks. Phased installation of the occluder. The defect of the interventricular septum is the most common CHD. It accounts for between 20% and 25% of all congenital heart defects and disorders. When DIBP has a hole in the septum located between the two lower chambers of the heart - the ventricles. 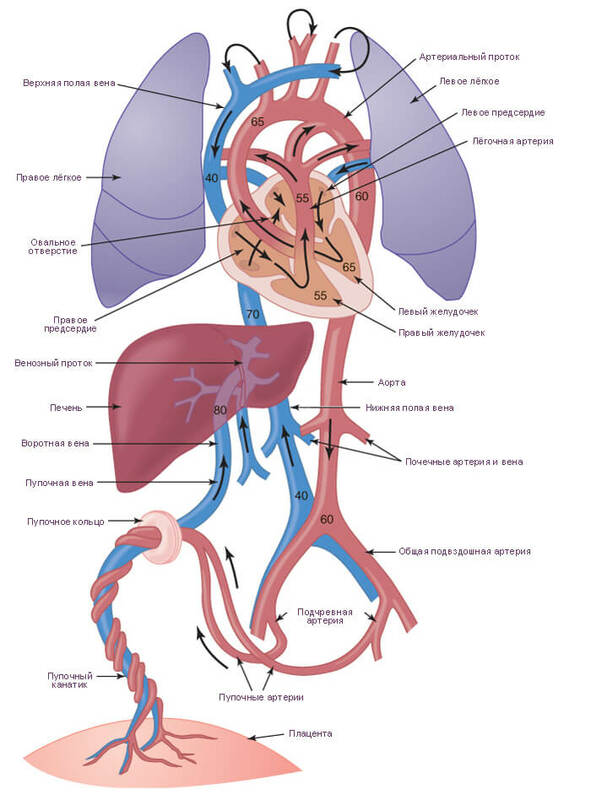 As in the case of the atria, venous blood is deprived of oxygen in the right ventricle, and oxygen-containing arterial blood in the left ventricle. These defects can vary greatly in size, but they all lead to the mixing of oxygen-containing blood from the left ventricle with blood deprived of oxygen from the right ventricle. Most children with CHD tend not to perform surgery during the newborn period. 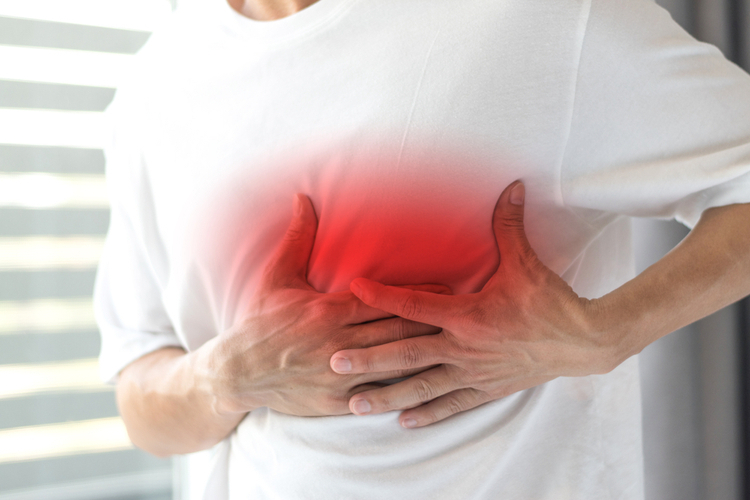 Instead, doctors are monitoring.However, in some cases, the heart may be too overloaded, because an excessive amount of blood is pumped into the lungs from the right ventricle. This leads to a very inefficient organ function: the blood, which has already been saturated with oxygen in the lungs, returns to the lungs again. When this occurs over a long period of time, the heart can grow in size. Due to these disorders, some children may not develop normally, especially if the VSD is large. Surgical correction is performed to eliminate the communicating hole, for which it is sutured. Postoperative hospital stay is 5-7 days. In obstructive disorder, the blood flow is restricted or completely blocked. This disorder can be detected in any of the four valves of the heart. 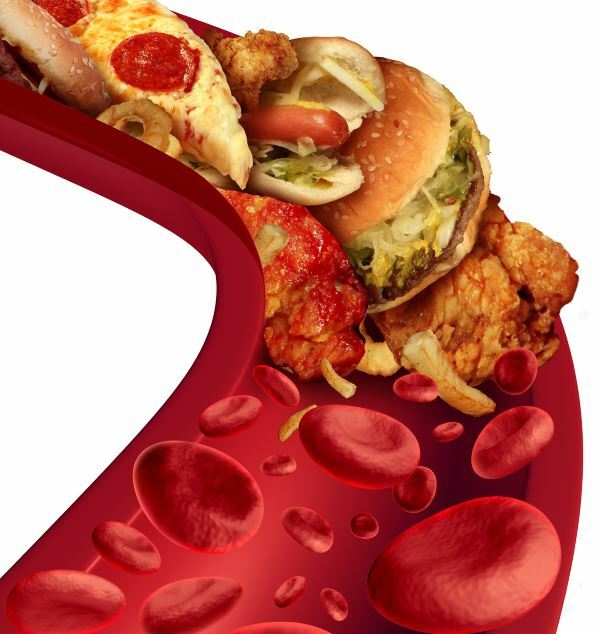 Blockade (atresia) or narrowing (stenosis) may occur in the vessels through which blood returns to the heart (through the veins), or in vessels that drain blood from the heart (through the arteries). Aortic stenosis accounts for approximately 5% of all CHD. Aortic stenosis is a narrowing of the aortic valve. The aorta is a large artery through which oxygenated blood is supplied to all organs and tissues. The aortic valve is located in the left ventricle and acts at the entrance to the aorta. Depending on the severity of stenosis at birth, the child may experience symptoms, mainly related to a decrease in blood flow and a decrease in oxygenation of the body. When the defect closes, the symptoms usually become more acute. 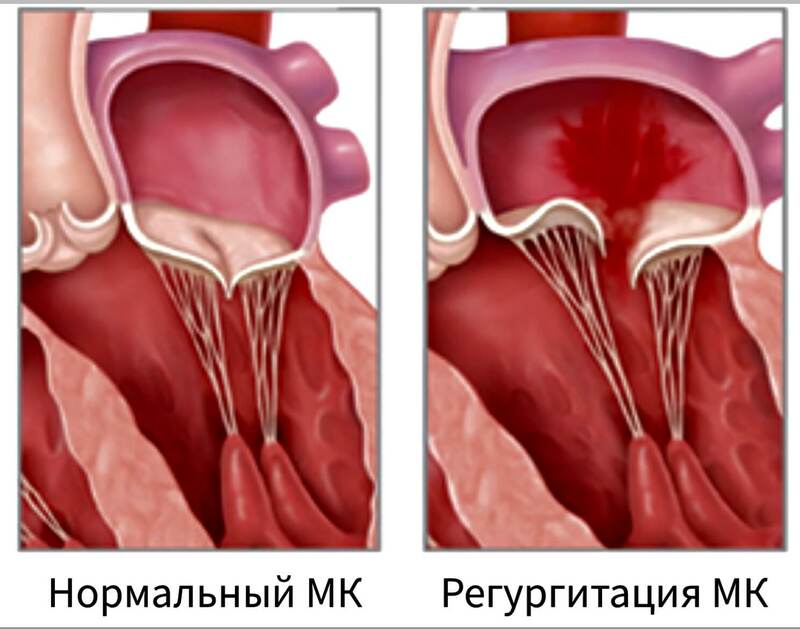 Sometimes, percutaneous balloon valvuloplasty (valve opening) can effectively eliminate stenosis. This procedure is based on the use of a special catheter equipped with a balloon in the deflated state, which is supplied through vessels to the aortic valve. At the right moment, the surgeon inflates the balloon, which allows you to stretch the valve and expand the hole. 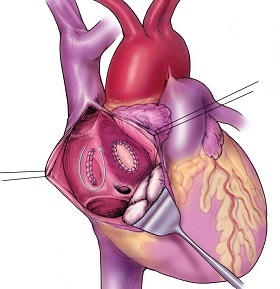 Surgical reconstruction reduces the obstruction to blood flow through the aortic valve. Postoperative hospital stay is from 7 to 10 days. Pulmonary stenosis accounts for approximately 5–8% of all CHD. Pulmonary stenosis is a narrowing of the pulmonary valve, which is located at the entrance to the pulmonary artery. The pulmonary artery is a major vessel through which blood is transferred from the right ventricle to the lungs. The pulmonary valve is located in the right ventricle and regulates blood flow through the pulmonary artery. Due to the narrowing of the valve, the right ventricle must work diligently to push blood through the narrowed orifice. If the pressure in the right ventricle increases excessively, surgical treatment is carried out as soon as possible. In some cases, the valve may be stretched using balloon valvuloplasty. This procedure is performed with the participation of a special catheter equipped with a balloon, which is supplied to the pulmonary valve. The balloon inflates, causing the valve bore to expand. 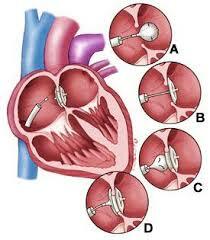 Sometimes a surgical reconstruction of the valve is performed, during which the CHD is removed. This operation is most often performed using a heart-lung machine. Postoperative hospital stay is 5-7 days. Coarctation of the aorta is about 8% of all CHD. Coarctation of the aorta - the narrowing of any part of the aorta. The aorta is a large artery that supplies blood to the entire body. The left ventricle pumps blood through the aortic valve into the aorta, through which blood eventually flows to all organs and tissues. Some babies do not have symptoms of illness at birth, but they may appear during the first week of life. Surgical intervention is performed to open a narrowed area of ​​the aorta, which allows for normal blood flow throughout the body. This operational manipulation is carried out by means of an artificial blood circulation apparatus. Postoperative hospital stay is 4 to 7 days. In this form of CHD, cyanosis is the main symptom, because the circulating blood is not normally saturated with oxygen. Cyanosis - bluish discoloration of the skin due to lower levels of oxygen in the circulating blood. Many children with blue heart defects are assessed as healthy at birth, because blood circulation follows the same path as that of the fetus. This circulation channel provides adequate communication of oxygen-containing blood with non-oxygenated blood, which allows maintaining the body's perfusion at the proper level. But after 2-7 days, as soon as these structures of the fetus begin to close, the infant begins to show serious violations that require immediate surgical intervention. left hypoplasia syndrome of the heart. The Fallot Tetrad makes up approximately 10% of all CHD. Pathology consists of four defects. The first defect is a narrowing of the pulmonary valve. Because of this narrowing, less blood is pumped from the right ventricle to the lungs. There are different severity of constriction. The second component is a large defect, which is a hole between the ventricles. As a result, a large amount of non-oxygenated blood from the right ventricle passes into the left ventricle without entering the lungs. The body is supplied with blood depleted in oxygen. The third component is an increase in muscle (hypertrophy) of the right ventricle compared to the left because of the large load associated with pushing blood through the narrowed pulmonary valve. The last, fourth, defect is the displacement of the aorta, which is located directly above the defect. Because of this placement, blood from the right ventricle, deprived of oxygen, quickly enters the aorta and then to all organs. Often, to improve pulmonary blood flow, a palliative surgical procedure called BT anastomosis is performed first. Later, surgeons perform corrective surgery or complete repair of the defect, which allows you to find time for the development of the left and right arteries. With each surgical procedure, the heart-lung machine is used. Postoperative hospital stay averages from 1 to 2 weeks. The transposition of the great vessels makes up approximately 5% of all CHD. Normally, the right side of the heart pumps oxygen-free blood, directing it to the lungs through the pulmonary artery. In the left side of the heart enters the blood from the lungs, which is then pushed out through the aorta and spreads throughout the body. With the transposition of the great vessels, the aorta connects to the right ventricle (and not the left), so instead of the right ventricle pumping blood into the lungs, it sends it back into the body. The pulmonary artery also connects not to the right ventricle, but to the left ventricle, which receives blood from the lungs and then goes back to the lungs. As a result, there are two deprived of communication circle of blood circulation. One by one recycle non-oxygenated blood from the body to the body; and on the other - oxygen-containing blood from the lungs to the lungs. Children with transposition of great vessels need the first time the oval hole to remain open for mixing oxygen-containing oxygen-free. Corrective surgery is performed using the heart-lung machine in the newborn period after the child has been given a couple of days so that he can adapt to life outside the uterus. Surgery is aimed at restoring the normal position of the arteries. Postoperative hospital stay ranges from 1 to 2 weeks. Atresia of the tricuspid valve : The tricuspid valve is located between the right atrium and the right ventricle. In atresia of the tricuspid valve, the right atrium is not able to pass blood into the right ventricle in sufficient quantity, because the structure of the valve leaflets is disturbed. Since the right ventricle does not work normally, it becomes smaller and underdeveloped. In some cases, this defect can be represented by only one ventricle, that is, instead of the left and right ventricles, only one large lower chamber is defined. The survival of an infant with tricuspid atresia depends on the connection between the right and left atria, namely the presence of atrial septal defect, as well as the ventricular septal defect, if there are two ventricles. The choice of surgery depends on heart disorders. Reconstruction is usually complex and is carried out in stages.Initially, a surgical procedure, called BT anastomosis, is performed, which is aimed at increasing pulmonary blood flow.Postoperative hospital stay for the initial procedure is 5-7 days. Atresia of the pulmonary valve is less than 1% of all CHD. The pulmonary valve is located at the exit of the right ventricle into the pulmonary artery, through which blood is transported from the right ventricle to the lungs. If there is an interventricular septal defect associated with this defect, it is usually considered part of Fallot's tetrad.However, if this blockage is associated with an intact ventricular septum, it can be defined as a hypoplastic right ventricle. In this case, the right ventricle and tricuspid valve are poorly developed. At birth, children with such defects depend on the blood circulation pattern remaining after intrauterine development, that is, the oval opening and the botanal duct. Children with atresia of the pulmonary valve and ventricular septal defect are most often shown to have anastomosis BT.A child without VSD requires more complex surgical reconstruction, which consists in the phased planning of surgical intervention, taking into account the anatomical features of the child. Postoperative hospital stay is from 1 to 2 weeks with the establishment of anastomosis BT. Truncus arteriosus (or common arterial trunk) makes up less than 1% of all CHD. This anomaly combines the aorta and the pulmonary artery into one large arterial vessel, instead of two. This formation is usually located above the large VSD. Valve anomalies are usually associated with this combination vessel. As a result, this combination of the aorta and the pulmonary artery causes blood to flow from left to right, causing congestive heart failure. In this case, the heart works more intensively than usual to saturate the body with oxygen. Surgical intervention for the elimination of the defect is extensive and requires the use of a heart-lung machine. This reconstruction is usually performed in several stages. Postoperative hospital stay is 10-14 days. 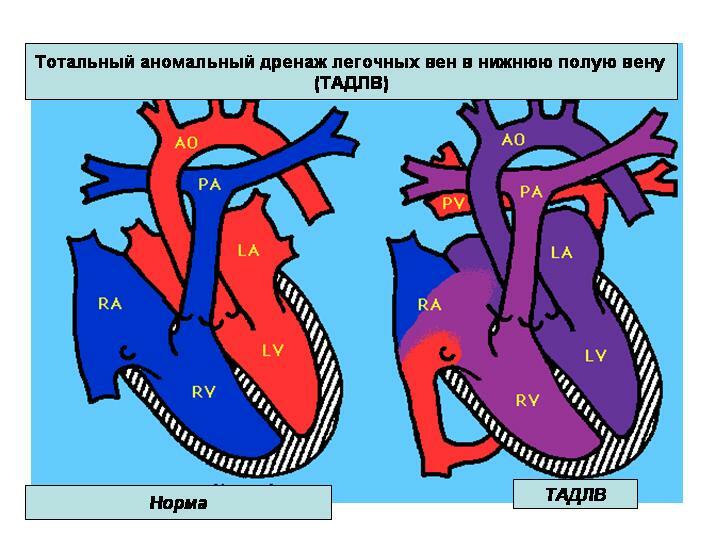 Total abnormal drainage of the pulmonary veins (TADLV) is approximately 1% of all CHD. With this defect, the pulmonary veins, which usually bring blood to the left atrium from the lungs, are not connected with it. Instead, some or all of the pulmonary veins are abnormally located and deliver blood to the right atrium. Infants with this disease depend on the blood circulation of the fetus, which for some time remains intact. The blood passing through the oval hole fills the left atrium. Oxygenated blood from the pulmonary veins is mixed with oxygen-free blood, usually located in the right atrium. As a result, it enters the left atrium, from where it enters the left ventricle and then along the aorta is delivered to all organs. Mixed blood, which flows through the aorta to all parts of the body, usually contains a low amount of oxygen, so the blueness of the skin can be determined in patients. Surgical intervention is carried out for a couple of days, using the cardiopulmonary bypass. Postoperative hospital stay ranges from 10 to 21 days. Infants with this disorder depend on the circulation of the fetus, which is still active for some time after giving birth. In order for oxygen-rich blood to reach the body, the right ventricle pumps blood into the pulmonary artery. Part of this blood passes through the open arterial duct into the aorta and eventually spreads throughout the body. If a child with this defect is not promptly operated on, then the probability of death is very high. When AGLOS is carried out such surgical intervention as palliation. The left ventricle is the main muscle of the heart, and if it does not develop in the fetus, it cannot be developed after birth. Palliation is aimed at using the right ventricle, which will have to act as the primary muscle of the heart. This is a complex surgical procedure that is carried out in stages. The first operation is usually performed shortly after birth under the guise of a cardiopulmonary bypass. Then the patient is at home under observation, awaiting the next operation. The second intervention is performed at about 3 to 4 months of age. The final planned surgery is approximately 2 years. Postoperative hospital stay is 5-7 days for the first operation. Congenital heart disease is the most common congenital defect in the United States. On average, congenital heart defects are defined in one of 120 babies born. Over the past 60 years, there have been changes in surgical and medical treatment methods that today allow more than 90% of sick children to go into adulthood. CHD whose correction needs to be revised. Newly recognized CHD or who were not treated in childhood. CHD, complicated by new rhythm disturbances and / or the need to install a pacemaker. CHD in case of problem pregnancy. CHD in patients with problems in physical activity and learning. CHD in patients with other cardiovascular or age-related health problems. A uniquely wide range of heart defects affects a complex population of patients, which can be classified according to varying degrees of severity and prognosis. The American College of Cardiology Task Force 1 (American College of Cardiology Task Force 1) of the 32nd Bethesda Conference developed a classification scheme for the distribution of patients according to the severity of the disease. There are three classes or categories: simple lesions, moderate lesions and complex lesions (see Group 1, 2, 3 below) with recommendations for subsequent observation of each of them. The main problem for adults with CHD is a common misconception that corrective operations are “healing”. At the conference, it is indicated that all adults with congenital heart defects are seen at least once in adulthood in the relevant medical institution for CHD, and most of them need regular follow-up cardiac care. This is because most of these patients, with the exception of individuals with ligation and a divided arterial trunk, were at risk of various complications. 1. Use advocacy programs to identify a “lost” population with CHD. 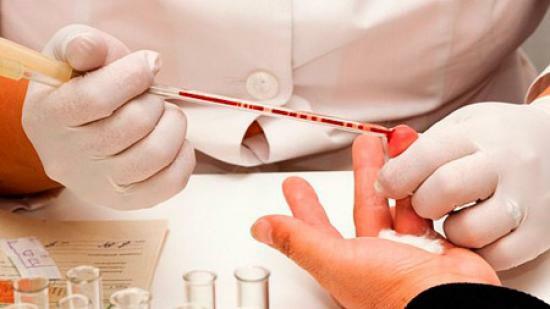 c. development and conduct of multicenter clinical studies. 3. Develop technologies to support hemodynamic and functional modeling of individual patients, improve the understanding of cardiac status and plan for future therapy. 4. Provide consensus on training requirements. 5. Determine funding for clinical and research training that is needed to provide a sufficient number of doctors to treat patients with CHD. In the coming years, the main focus will be on creating a national database of ACHD, which will become a catalyst for research based on hypotheses to promote evidence-based medical care for this group of patients. Patients in this category do not need special treatment, so they can be treated in standard medical conditions. Isolated congenital aortic valve disease. An isolated congenital lesion of the mitral valve (with the exception of the parachute valve). An isolated defect in the oval opening or a small defect in the interatrial septum. The isolated defect of an interventricular partition (without the connected damages). Mild stenosis of the pulmonary trunk. Previously ligated or occluded arterial duct. Reconstructed atrial septal defect without complications. Reconstructed ventricular septal defect without complications. Patients with this category should be periodically observed in regional centers specializing in CHD. Total abnormal pulmonary vein drainage (partial or complete). Defect of the atrioventricular canal (partial or complete). Funnel constriction of the outflow of the right ventricle. Atrial septal defect by ostium primum type. Smoothing of the pulmonary valve (moderate to severe). Stenosis of the pulmonary valve (moderate to severe). Fistula or aortic sinus aneurysm. Atrial septal defect type sinus venosus. Aortic stenosis subvalvular or supravalvular. Patients in this category should be monitored regularly by doctors who specialize in congenital heart defects in adulthood. Blue congenital heart defects (all forms). Double exit from the ventricle. Atresia of the mitral valve. Atresia of the pulmonary artery (all forms). Transposition of the main arteries according to type D.
Transposition of the main arteries of type L.
Atresia of the tricuspid valve. 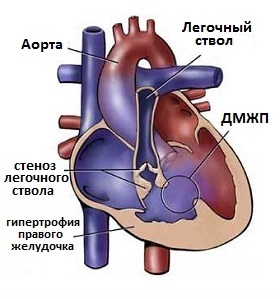 This group also includes other abnormalities of the atrioventricular or ventriculo-arterial connection, not included above (for example, the cruciform heart, isomerism, heterotactic syndrome). There are many classifications of congenital heart defects, but most often they are used to determine the severity of the pathological process. Based on the analysis carried out, the tactics of treating the patient are selected. In some cases, as with blue defects, immediate surgical intervention is required that can save the life of the newborn. There are cardiovascular diseases that can lead to permanent loss of disability. In order to prevent such complications, timely treatment should be performed. Therefore, in identifying the acquired heart defects, it is not necessary to delay with the implementation of medical recommendations. During fetal development of the fetus under the influence of predisposing factors, normal formation of the cardiovascular system may be disturbed. As a result of this, congenital malformations are created that can be compatible and incompatible with life. The development of pathology is often associated with the wrong way of life of the mother during pregnancy, although in some cases, heredity plays a big role. One in 120 babies is born with a heart malformation. Some of them are heavy, but in most cases, they do not represent danger. Defects may include abnormal walls or heart valve shapes, as well as blood vessels that fit or depart from the heart.